The Crowd-Sourced Intelligence Agency (CSIA) is an online application that replicates and displays some of the known techniques used by intelligence agencies to collect and process open source information. The app uses technical manuals, research reports, academic papers, leaked documents, and Freedom of Information Act files to construct an Open Source Intelligence (OSINT) system that's accessible to the public. OSINT is gathered from publicly available sources like social media, academic articles, and public data. The application consists of five main parts: The Social Media Monitor, a surveillance interface where users evaluate Tweets based on their threat to national security. Two Naïve Bayes supervised machine-learning classifiers that automatically label tweets as suspicious or not suspicious that users can review for accuracy and idiosyncrasies. The Social Media Post Inspector, where users can submit text to see if a post is likely to be considered threatening by intelligence agencies before sharing it on social media. 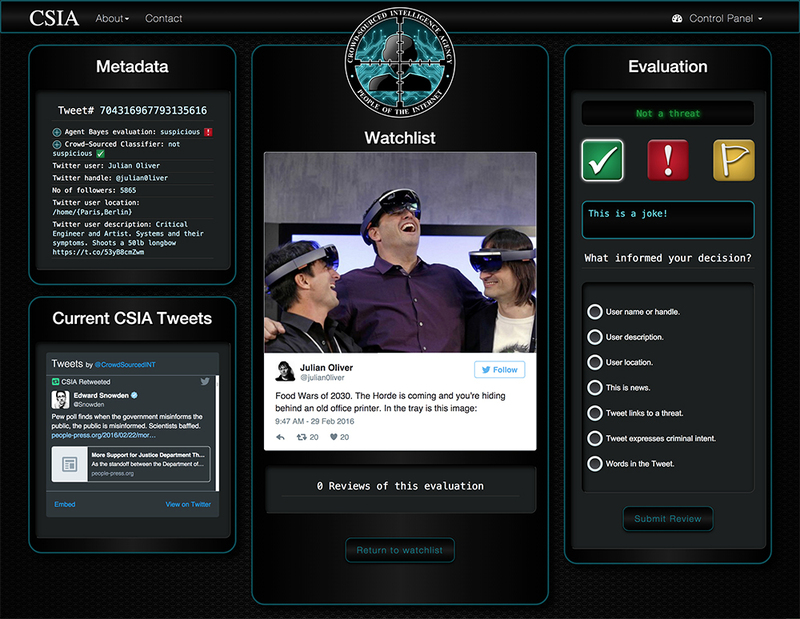 The Watchlist, where users can target themselves and others as subjects of social media monitoring, and which provides automated evaluations from our machine-learning classifiers to show how social media posts may be treated by OSINT surveillance systems. A Resource Library that links to documents that informed the creation of the app. The goal of the CSIA is to expose potential problems, assumptions, and oversights inherent in current dataveillance systems in order to help people understand the effectiveness of OSINT processing and its impact on our privacy. 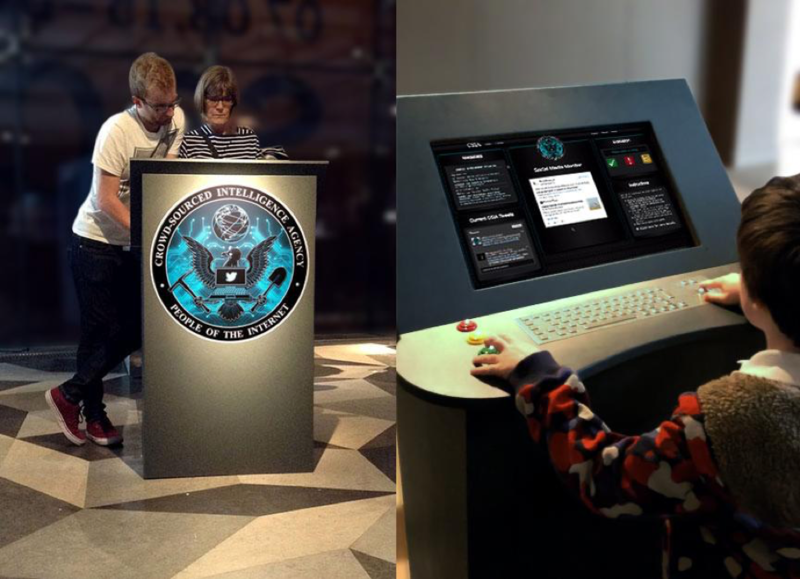 The CSIA provides first-hand experience with social media monitoring, allowing users to choose how they want to navigate social media surveillance. Anyone with access to the internet can use the app. If a user signs up as a CSIA agent using an email account, they can gain access to all of the features. Without signing up, users can access the Resource library and social media Post Inspector.